Swedish Automobile CEO Victor Muller: "There is always a plan B." AMSTERDAM (Reuters) - The chief executive of Swedish Automobile said on Friday he had turned down a full-blown takeover offer from China's Zhejiang Youngman Lotus Automobile Co. and Pang Da Automobile Trade Co.
"The token offer was unacceptable because it would trigger every conceivable change of control clause and that would possibly mean the end of Saab," Swedish Automobile CEO Victor Muller told Reuters in an interview. Muller would not disclose the value of the offer. 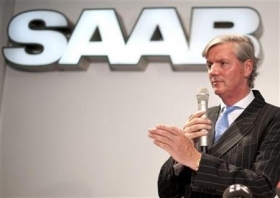 Because the two Chinese car makers were still interested in Saab, they should stick to the terms of a deal signed in July that would see them take a combined 53.9 percent stake in Amsterdam-based Swedish Automobile, he said. The administrator in charge of Saab's reorganization asked on Thursday that a Swedish court pull the plug on bankruptcy protection, just hours after an investment firm pledged new cash to help keep the struggling car maker alive. Muller said he expected the court to hear the case next week. He added that he did not think the Swedish government was interested in taking over cash-strapped Saab. "There is always a plan B," Muller said when asked what he will do if the Chinese companies walk away. Asked what the plan is, he said he would reveal it "only if we resort to it." Saab, which has produced few cars since it first halted production in March because of a lack of money, avoided bankruptcy last month after a Swedish court granted the voluntary reorganization.